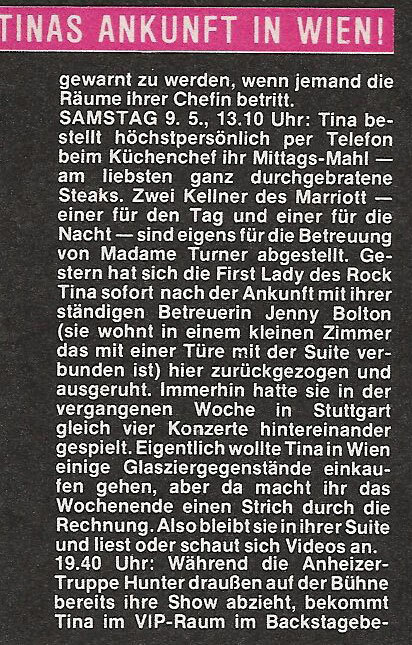 In the beginning of May, Tina still was in Germany to perform in Hannover and Stuttgart. After completing these incredible concerts, Tina flew to Austria to perform in Vienna. Normally Tina loves to visit the town or country where she stays for shopping and culture. This time she had to stay in her room. The fans from Austria waited for hours to spot the Queen to meet her or get an autograph. She was going to do three concerts in Die Stadhalle in Vienna. 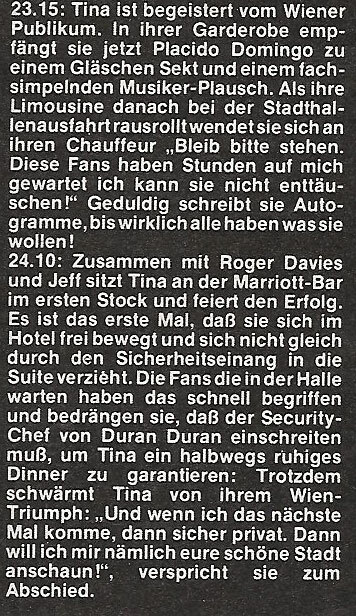 After she did the first concert, Tina had to leave immediately to go back to hotel. Her staff and security were stunned when she saw a crowd of fans waiting for her for hours and hours to meet Tina in person. Tina couldn’t ignore them anymore, and asked, against all rules, to stop the car, because she had to meet her fans and give them what they wanted. She simply said: "They are my fans and I have to treat them as well as they are treating me". Tina got out of the limo, and started to make contact with her fans, shook hands, handed out autographs or took pictures with them. She went on until everyone was pleased and got what they wanted. Tina also received a few golden and platinum records for her recordsales in Vienna before and after her concerts in the V.I.P room. Tina was happy that her music was well recognised in Austria as well and it turned out to be a wonderful and memorable moment for our Queen. 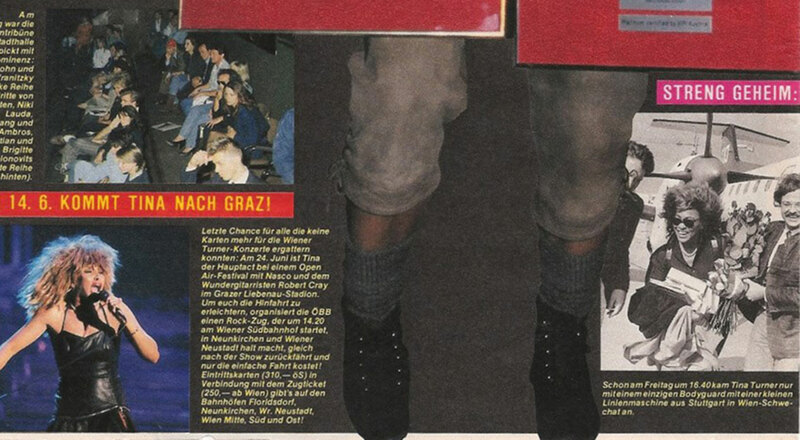 Here are two Austrian magazine reports from Rennbahn Expess 1987. We’re leaving Spain!!! The flamenco country full of sun and beaches. Tina had a number 1 hit with "Two People" and the "Break Every Rule" album did very good in Spain. 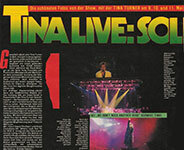 Tina did 3 concerts in 3 cities in Spain, Madrid, Valencia and Barcelona. 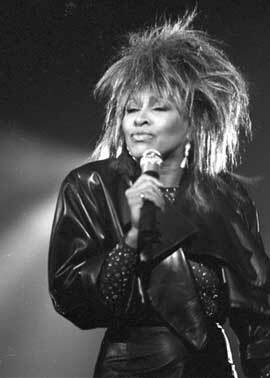 Tina also performed on a Spanish TV programme called Tocata. She did an interview and performed "What You Get Is What You See", "Typical Male" and "Two People". After Tina’s explosive and sold out concerts in Spain, she went to the country of romance, faith and pasta. Yes, we’re talking about Italy. A one night only show in the Amphitheatre in Verona. Where she gave the Italian Fans an incredible night to remember. The concert was recorded by an Italian TV Show and they’ve made a special out of it. Pieces from the concert interspersed with interviewing Tina. Tina also visited an Italian TV Show in this period. A show called Fantastico! Here is "Two People" of that show. 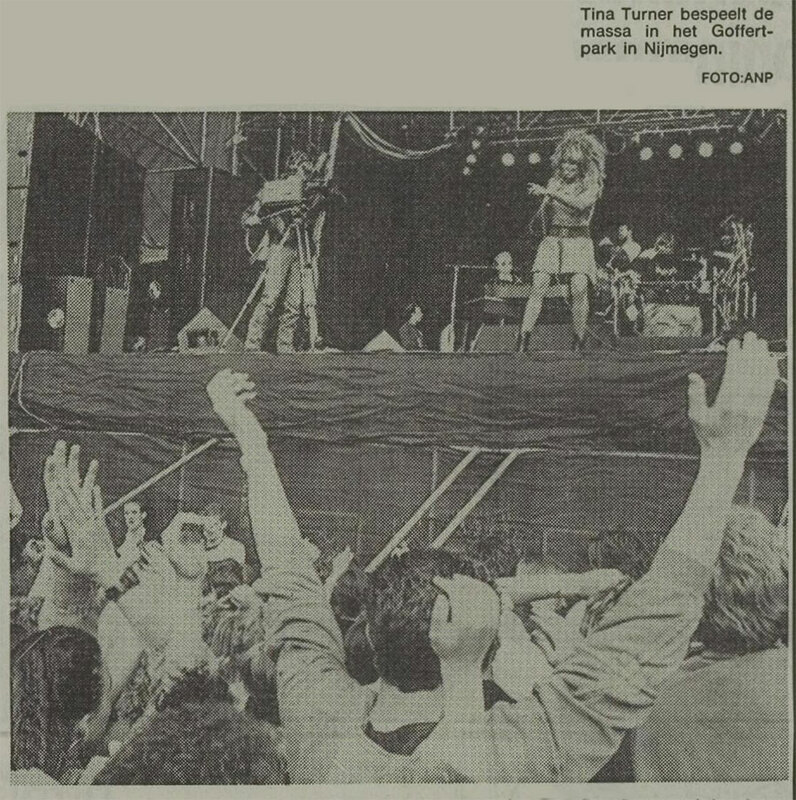 After Tina’s gig in Italy, she went back to France for 2 nights in 2 towns, Montpellier and Lyon. We can’t find anything about these nights, so we’re moving on to the next stop which was Nijmegen, The Netherlands. 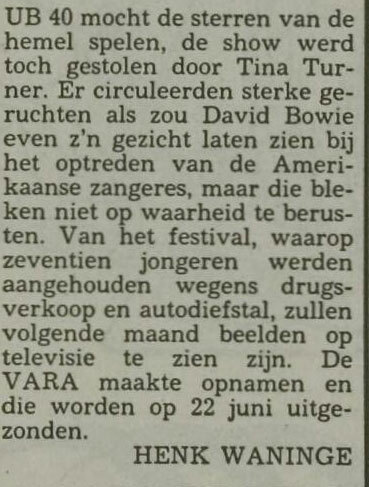 Tina’s second and last visit to The Netherlands during the "Break Every Rule Tour". 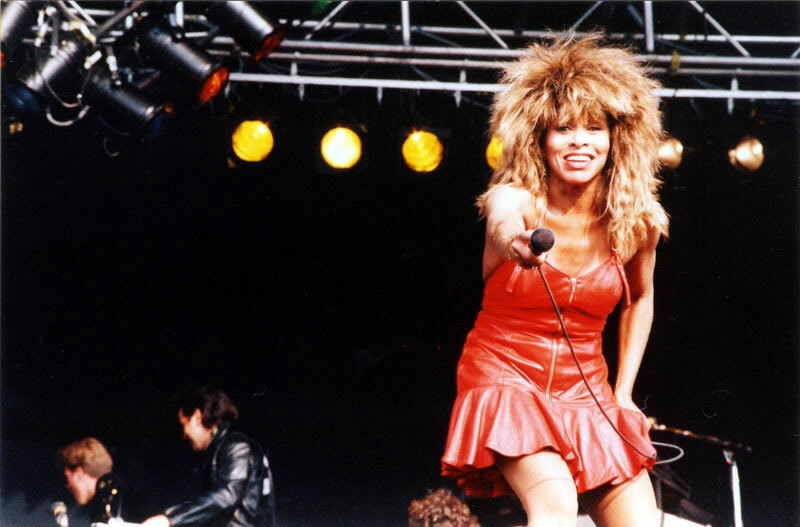 Tina was the headliner of the festival. The press was amazingly good to Tina. They told us that all the other bands like UB40, Robert Cray and Paul Brady were fading away next to Tina and 45.000 people went completely crazy when Tina came on stage like a tornado on the intro of "What You Get Is What You See". She was by far the most exiting act and was unbeatable. 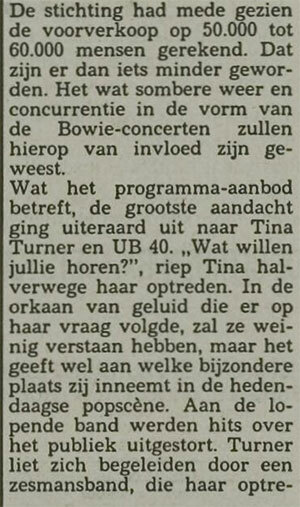 We have some pictures for you, a newspaper report and of course 2 video’s of Tina performing in Nijmegen. Tina’s Dutch adventure was over and it’s was time to go the the UK. The last date in May for Tina was a festival in Dublin. This concert was a memorable one for Tina. With an audience of 60.000 enthusiastic fans she nearly stopped the concert. Fans in the front row were getting crushed by other fans. It was an explosive and massive concert. Here are 2 pictures of this huge event. For more pictures, click here. Around this time, Tina’s next single was released. The single "Break Every Rule" which was taped in Dortmund a month before. The song had minor success and wasn’t released in all countries. You’ll hear more of this song in our next post.